A steady drumbeat of events has set the stage – and thrust into the spotlight – the importance of sustainable urban mobility at this year’s climate conference, COP23. The Climate Action in Transport Conference in Berlin, part of the annual European Mobility Week and the first Transport and Climate Change Week, demonstrated the large and growing interest in the transport sector’s potential to deliver significant emissions reductions earlier this fall. 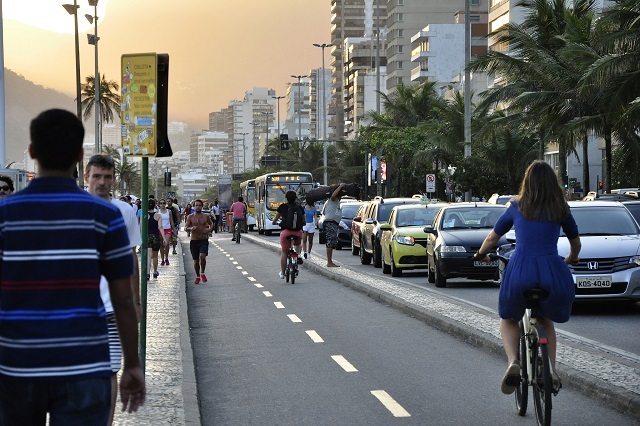 As the world increasingly looks to subnational actors for climate leadership, major global agenda-setting gatherings, like this year’s COP and the World Urban Forum in February, have wide ramifications for urban transport. Transport contributes 23 percent of global energy-related greenhouse gas emissions, and cities account for more than 60 percent of all kilometers travelled globally. The most urgent question for transport now is how to increase the ambitions of national governments to decarbonize the sector and ensure implementation comes through at the local level. Global climate discussions are focused on the integration of national and local policymaking in an effort keep warming to less than 1.5 degrees Celsius beyond pre-industrial averages. Transport policy similarly needs to be adjusted at multiple levels. 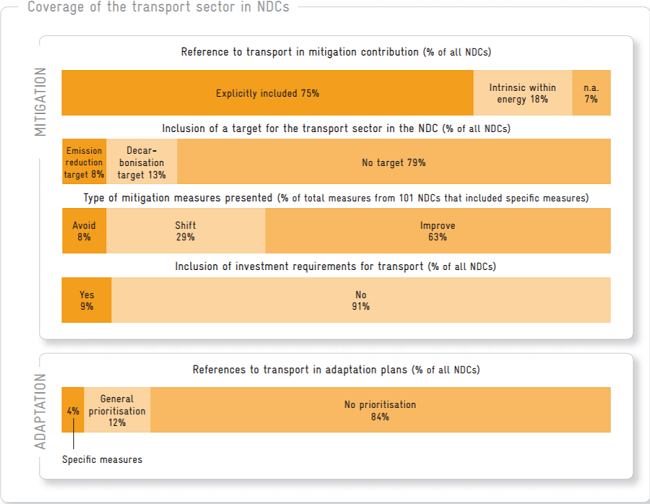 Transport is currently included in 75 percent of Nationally Determined Contributions (NDCs), the voluntary commitments made as part of the Paris Agreement (see Figure 1). But most – 79 percent – do not include any specific, transport-related targets. Subnational actors can and should play important roles in creating appropriate targets. In the next round of NDCs, which will begin with the Facilitative Dialogue in 2018 and result in new “enhanced” NDCs by 2020, experts are also looking for countries and cities to identify specific actions in the transport sector in order to prioritize those with the highest mitigation and development impacts. Previous analysis of transport-related NDCs has shown that global initiatives are missing outstanding opportunities for effective local climate action. NDCs that currently include action for the transport sector disproportionately concentrate on technological measures, like electric vehicles. For example, reducing energy use and changing how and when people travel can be more effective, since electric vehicles have little effect on climate change as long as the power sector remains profoundly reliant on carbon-heavy fuels. A more comprehensive implementation strategy specifically designed for the transport sector is “Avoid-Shift-Improve,” which simultaneously encourages higher system, trip and vehicle efficiency. “Avoid” refers to minimizing motorized trips through changes in land use or policies like congestion pricing. “Shift” refers to tilting the modal split toward more public transport and non-motorized travel. “Improve” focuses on technological advances to reduce emissions, such as improving fuel quality and vehicle electrification. Few jurisdictions have provided explicit targets for their transport sectors so far. Aside from improving fuel efficiency, much of the climate mitigation potential of the urban transport sector remains untapped. Urban transport is an area where cities and states can act as policy architects and showcase their huge potential to reduce carbon emissions and improve quality of life. Indeed, at COP23, there is more focus on subnational actors than ever before. While negotiators meet in Bonn, a series of transport side events are scheduled throughout the conference, including on the thematic transport day, November 10, and during high-level focus on SDG 11 on November 13. The Paris Process on Mobility and Climate and Partnership on Sustainable, Low Carbon Transport are also hosting a daily talk show on transport and climate change at 6:00pm CET from November 7-16. Cities can create better outcomes through infrastructure for electric vehicles, bus rapid transit systems and innovative bike-sharing schemes, to name a few transport interventions with potentially large impacts on climate emissions. Such changes could be replicated quickly and bring other benefits, including safer streets, more economic productivity and reduced pollution. But change does not happen by itself; cities and national governments need to step up to the challenge. These actions make most sense in close coordination with regional and national planning. And in some cases, cities need assistance with technical capacity and funding. National leaders should recognize and support mayors and other subnational climate champions as partners on the road to 2020. Recognizing the potential of actors at all levels is crucial for tracking and raising climate ambition across the board. Angela Enriquez is a researcher and program coordinator for the Energy and Climate Team at WRI Ross Center for Sustainable Cities. Linus Platzer is a climate and energy intern at WRI Ross Center for Sustainable Cities.